During the winter days, many people complain about dry and chapped lips. 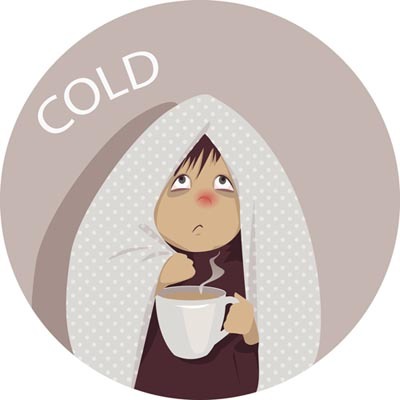 Cold temperature and dry indoor air take away the moisture from the lips and make them dry and chapped. With a little extra effort and few home remedies you can solve the problem of chapped lips. In addition, these home treatments are pocket friendly and you do not have to worry about side effects. Here are some of the easy homemade treatments for dry and chapped lips. Honey: It is one of the best things for chapped lips. Simply apply a small amount of honey on your lips, massage gently for a minute and then go to bed. Repeat daily for best results. Another benefit of this simple treatment is that it will take care of your dark lips caused by sun rays and excess smoking. Green tea bags: Instead of discarding a used green tea bag, you can use it to treat your dark lips. After making a cup of green tea, keep the green tea bag aside and allow it to cool. Now take the used green tea bag and press it against your lips for a couple of minutes. Follow this treatment 3 to 4 times a week during the winter season. Sugar: You can use sugar to exfoliate your lips to remove the dead skin cells. Mix together ½ teaspoon of sugar and few drops of olive oil. Now with the help of a small brush that has soft bristles, gently scrub your lips for a minute or two. Then wash it off with water and apply a good lip balm. Do this once or twice a week. Clarified butter: It also helps to keep your lips moisturized and prevent chapped lips. Massage your lips with a few drops of clarified butter before going to bed. In the morning wash it off gently and pat dry to enjoy soft supple lips. Cucumber: Cucumber juice is another great treatment for dry and chapped lips. Extract the juice of a small piece of cucumber, and apply it on your lips. Allow it to sit for half an hour and then rinse off with lukewarm water. Repeat this remedy once daily. Lemon: The juice of lemon is another secret behind soft, smooth and well moisturizer lips. To prepare a lip mask, mix one teaspoon of milk cream along with three drops of lemon juice and mix properly. Put the mixture in the refrigerator for an hour. Later, apply it on and around the lips before going to bed. Repeat this procedure daily for best results. Rose water: You can apply rose water on your lips and massage gently for a minute 2 to 3 times a day. Another option is to mix rose water with glycerin in the ration 1:2. Mix it well and then apply it on your lips before going to bed. The next morning wash it off with normal water. 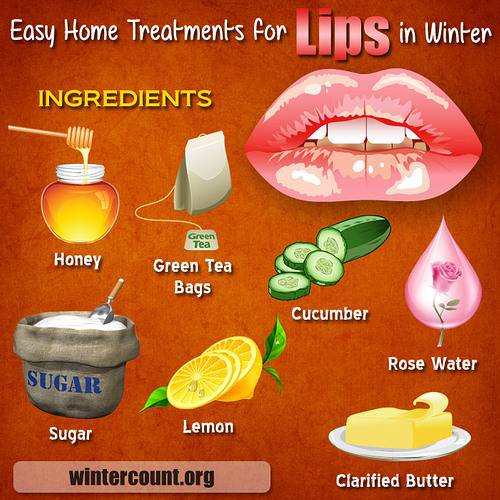 To sum up, with these easy home treatment you can keep your luscious lips healthy and moisturized throughout winter. Cracked heels look ugly and can compel you to wear covered shoes and sandals all the time. Cracked heels are not just the problem of cold winter months, as one can have cracked heels all throughout the year. Along with dry and cold winter season, there can be several reasons behind cracked heels. Some of the common reasons include, the way a person walks, poor blood circulation, skin problems like eczema or psoriasis, some kind of fungal infection, nutritional deficiencies as well as improper foot care routine. As the cause behind cracked heels can be many, it is important to find the root of the problem. Often with slight dietary as well as seasonal changes, the problem of cracked heels gets treated. There are even many natural remedies for cracked heel. You can check some sites like www.top10homeremedies.com, www.footvitals.com, www.stylecraze.com if you are interested in some natural remedies. Also, you can always use a foot cream to maintain the beauty of your heels. Instead of buying an expensive foot cream from the market, you can easily make one at home with some easily available ingredients. Each of these ingredients has either moisturizing or nourishing properties that can help to keep the heel well hydrated, moisturized and nourished. 1. First of all put one-forth cup of magnesium flakes in a small container. 2. Then pour two tablespoons of boiling water in to the container. 3. Stir the content properly until it dissolves and you get a thick liquid. Set aside the thick liquid to cool. 4. Now put a medium sized mason jar inside a small pan with one inch of water. Put in the jar the coconut oil, beeswax and shea butter. Put the pan on medium heat. 5. Once the ingredients melt properly, remove the jar from the pan and allow the mixture to cool down. 6. When the mixture cools down and has slightly opaque consistency, put the content in to a medium bowl. 7. Now with the help of a hand blender, start blending the oil mixture. 8. While blending, add the dissolved magnesium mixture to the oil mixture little by little. Blend until all the ingredients are mixed properly. 9. Next you need to add the oregano essential oil and peppermint essential oils and whip the whole mixture again until all the ingredients get combined properly. 10. Put the mixture in the refrigerator for 15 minutes. 11. Take out the mixture from the refrigerator and re-blend again until you get butter like consistency. 12. You can store the content in the refrigerator or at room temp for up to two months. Your homemade foot cream is ready for use. Use the foot cream on your cracked heels before going to bed at night. Apply a thick coat and wear socks and then go to sleep. For best results, exfoliate feet with dry skin using the pumice stone once to twice a week. If used on a regular basis, this soothing and nourishing foot cream will solve the problem of cracked heels forever. If chapped lips are a problem that you have in the winter months, then don’t lick your lips. This may give you temporary relief but in the long run it will worsen the condition of your lips. To soothe your dry and chapped lips, you need to use a lip balm and apply it on your lips several times a day. There are many types of lip balm available in the market. Most of the lips balms have hydrating and moisturizing ingredients that help to keep the lips soft and supple. Well, if you are not sure as which lip balm you should buy, then it is a great idea to make one at home. To make a lip balm at home you need some simple ingredients that are easily available at home. One tablespoon of yellow beeswax. Beeswax is very moisturizing, can help protect the lips from UV rays, and has a pleasant smell. Two tablespoon of extra virgin coconut oil. The minerals present in coconut oil make your lips soft, smooth and kissable. A few drops of vitamin E oil. This oil also has moisturizing ingredients that help to fasten up the healing process. First of all you need to grate the yellow beeswax and keep it aside. Now add a few drops of vitamin E oil to the bottom of a measuring cup. Next measure out two tablespoon of coconut oil, and add it into the measuring cup. Then add one tablespoon of grated beeswax in the measuring cup. Mix all the ingredients properly until they blend properly. Now put the mixture into the microwave for about a minute. You must heat until the beeswax melts completely and the oil turns into a nice golden color. Take it out and stir and then pour it into a dry container. Allow the mixture to set up. It will take several hours to harden. Once the balm has a nice cream color and has a solid consistency you can close the container. Keep the airtight container in the refrigerator to increase its longevity. To help your chapped lips heal faster, first of all lightly use a toothbrush (make sure your toothbrush has a soft bristle and keep it light-handed) and brush your lips. It will help to remove the dead skin allowing your lips to heal faster. Then pat dry your lips with a soft cotton cloth and apply your homemade lip balm. Be it summer or winter, whenever you have dry and chapped lips, the solution is right there in your kitchen. Make your own lip balm and enjoy soft and supple lips throughout the year.